Begin here for the background story and here for Nelson Mandela’s prison. At the bottom, I’ve got some extra photos for viewing. 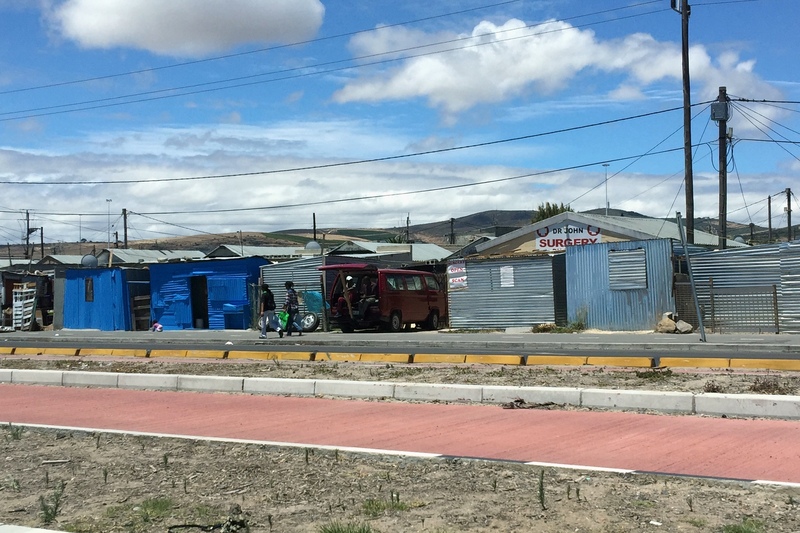 On my way from the airport to downtown Cape Town, the highway passed by a shanty town (a township). Not even 30 minutes in the country, I was stunned by the poverty I saw. Instantly, I thought of my kids and how incredibly good they have it. How immensely privileged they are and the thought that followed was how incredibly unaware (and subsequently ungrateful) they are. At that moment, I wished for my 6-year old daughter to see that sight. We’ve talked a lot for a while now about how fortunate we are to have a roof over our heads, a fridge with food in it, a pantry at our disposal. But that sight I saw brought everything to a new level. Feel free to click on the picture to get a closer look. Note the doctor sign. I made it to my family and we strolled through downtown Cape Town via a gorgeous park and had a delicious lunch. Table mountain in view, the scene couldn’t have been more gorgeous. Pristine conditions, stunning scenery. Including travel, it had been three days since I saw my children and I wasn’t having a hard time coping. The five-star treatment I was receiving from my family made me feel like a queen. Every now and then, I’d think about the kids and be grateful they weren’t with me. Climbing all the way to the top of the Cape of Good Hope (Cape Point) would have been a nightmare because inevitably, I would have ended up carrying the wee one. I reveled in the freedom to take my time at the top and I was so overwhelmed by the beauty before me that I was moved to tears. At that time, I was grateful for the kids’ absence. In fact, throughout the whole week, I was grateful they weren’t there. I was grateful that my husband wasn’t there. Not because I don’t love them but because it had been so incredibly long since I got to be just me. Carefree, without thought of another person. The farthest I needed to plan ahead for was what to wear to dinner that night. There was no magic cover over parenthood. Everyone understood how draining, wonderful, horrendous, precious, tiring and loving parenting is. No one was pretending to be successfully doing it all. No one was pretending it was easy. There were no veils of perfection at the front door. I was able to talk freely at shared frustrations, without judgement, because it was the norm to talk about such things. There wasn’t this silent but deadly competition going on to see who was the perfect mother. Then there were the stories I was told. The sights I saw. Not just the shanty towns. I visited an orphanage called the Home of Hope where I met some extraordinary children. Children who have been abandoned, or neglected. Also, children with special needs because fetal alcohol syndrome is a huge problem in South Africa. One child I met was Ethan (not his real name). He is eleven years old and we cheered him valiantly as he counted to three. You see, when he was eight years old, his mother died. So his uncle carried Ethan out into the ocean and drowned him. He did succeed. Ethan was dead. But someone saw and revived him. However, he was dead for so long that he is severely brain-damaged. Those are the situations children are facing. Yet, they were the happiest little people I’d ever met. My heart bled for all the children in that home. How hard it must be for them, to be abandoned or neglected, but when I voiced my thoughts, I was told that these children, the very ones I felt sorry for, were the absolute privileged of their community. These children had a solid home to live in, food everyday, love provided freely, even specialized teachers to provide an education to them. Just those things alone made them the luckiest of their kind. And that hit me in the gut. These were the times that I thought of my children. And honestly, the feelings weren’t good. I adore my children with all my soul, but they have no idea of hardship. They have no idea what goes on in the world. Yes, yes, they are too young for such knowledge to be imparted by me, but there are millions of young children living it. Here’s where my parenting changed. The dawning on me that my children are utterly lavished, living in the lap of luxury (comparatively), surround with so much food, so much toys, so much education, and yet it’s taken for granted by all. By almost all children regardless of age in this country. By most adults. The sense of entitlement has risen so high that it’s snuck into society as the norm and for me, that needs to be taken down a notch or fifty. A nice chunk of the problem is that we want to lavish our kids with stuff because we’ve grown up with the association that presents mean love. Early last year, hubby and I declared a family rule that we weren’t getting the children anything until it was their birthday or Christmas. If they wanted something, they could let us know and I would put it on a wish list. Come present time, we knew what to get. I’m comfortable with that arrangement. But there is still the gimme-gimme-gimme attitude bombarding us constantly. I want to change that for my children. I haven’t exactly figured out how to yet but I’m working on it. Anyway, back to being fabulous without children! I got to eat in the best of restaurants in Cape Town. Even spent a night in a vineyard, experienced the most delicious food ever, and found myself again. It was nice to know I could still be me. I could still be sociable, fun, witty, without having to dart my eyes across the room looking for the little ones, checking that they haven’t destroyed whatever is available. I could still hold my own at a party and I could still have a blast. About a year ago, someone asked me who I am and all I could come up with is “mother,” but now I’ve had this wonderful opportunity to step back from my life for 10 days. To live freely. To live well. To experience the beauty and the heartbreak that Cape Town offers. While I adored Cape Point, one of my favorite pictures of the whole trip is below. It sums up how I felt. I felt like I was on top of the world. All of Cape Town below, on top of Table Mountain, wind whirring, and a 360 degree view of pure beauty. Africa. I was actually looking at Africa. Albeit a tiny, miniscule part of Africa but it was Africa nonetheless. On top of Table Mountain. Now, all I need do is look at that picture, remember that feeling I had while standing there and take that deep breath. It was an intoxicating feeling, freedom at its best. My children were the farthest thing from my mind. Man, I could stare at that picture all day. My brother, his husband and I. By the second to last day, people around me were innocently asking or reminding me that I was leaving the next day. And I would cry. By the morning of my last day, I had banished all talk of the plane because each time brought tears to my eyes. I was threatening to not get on the plane. Even my new South African friend had offered me her spare bedroom!! But I knew I had to leave. I had to end the best week of my single, motherless life. Here’s where I have to thank, from the very depths of my soul, my brother and his husband for giving me this gift. And it truly was a gift in so many ways. On my last night, we were invited to a friend’s house for a barbecue. 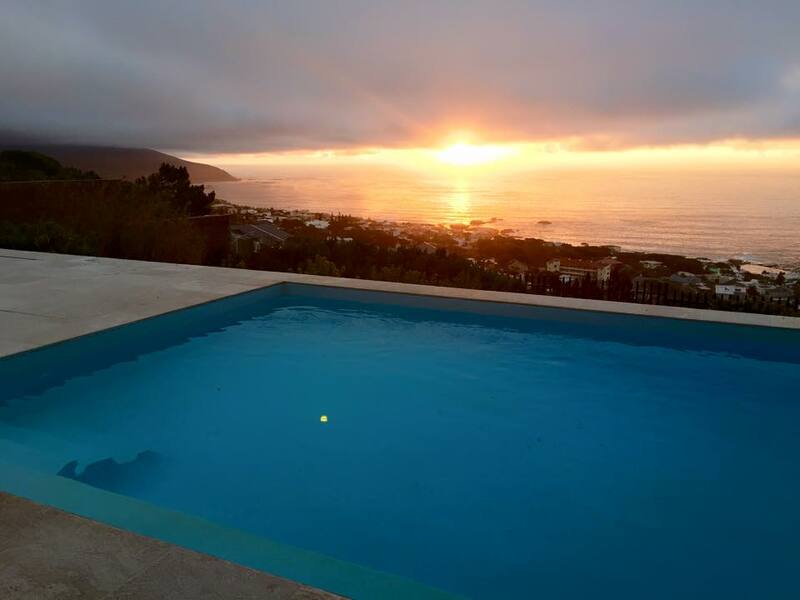 We arrived to this gorgeous house in Camps Bay, overlooking the ocean, mountains on the side, pool gleaming, sun setting. A discussion began on parenting and my brother explained that he thought I “over-parented.” I had to think a lot about that because he was spot on. It’s not just me. More than likely, it’s you and everyone else you know too. Because we are so intent on our children being happy, our children being provided for, that we forget to give them the respect they deserve. One of the most important aspect of that is to let them learn the ability to do things themselves. Letting them spread their wings. I’m not talking about avoiding being a helicopter Mom. I was never one of those, but I can’t deny that at home, I’ve spent the past 6 years running back and forth at every request. My husband doesn’t over-parent. If my daughter asks for a cup of water to drink, he tells her to go get it herself. Because the plastic cups are next to the fridge, easily in reach, and she knows how to do it. But she’ll ask me to do it for her. Sure, there are times when kids just need that extra loving and coddling. But most of the time, we fail to let them learn to be self-sufficient. My little three-year old monster will get his own water, but the six-year-old still tries to be waited on hand and foot. It’s not a hardship to make them get their own water. The world won’t end for them, they know how to do it. I just need to say no. It won’t break their soul. ‘No’ won’t send them to therapy. It causes a few tantrums here and there but they’ll get the gist of it soon enough. My own worst trait is that I cave under a rainstorm of “pleeeeeeaaaassssseeee” a thousand times because I just want the talking to stop. But now, my answer is simply “did you not hear my answer the first time?” I then add in a consequence to repeating the question. This trip wasn’t about them though. It was about me. And it made me realize how incredibly lucky I am, what a full, wonderful life I have. I may have cried for two days at the thought of returning home but that’s simply because I loved my temporary freedom and spending time with my family. God, how I loved every second of it. When I returned, the kids ran to me like never before, squeezing the life out of me, smothering me with kisses, reviving my soul in another way. They were so happy to have me home. It was an amazing feeling and for that, I am grateful. I am able to turn the microscope on my own life and realize how lucky I really am. I want to take with me the positivity of the South African people. An appreciation for what I have, what I can offer as a person and as a parent, who I am, and perhaps who I can be in the future. My <3 forever and for always to Cape Town, and to the two wonderful men that made it happen. Previous PostOver-Parenting: Part 2Next PostWhat has happened to Kindergarten?